Stephen A. Smith is the embodiment of everything hockey fans ferociously loathe about the way ESPN covers the NHL on its networks. It’s that drive-by, superficial analysis from basketball fans, treating hockey coverage with the enthusiasm of a child forced to visit that creepy old relative who smells like mothballs and is always cooking cabbage. It’s that ignorance of the sport, acting like a heavyweight boxer being asked to opine on the intricacies of Quidditch. And more to the point: It’s the damn, stupid, insipid, insulting, unprofessional pride with which they flaunt that ignorance. Like when Stephen A. Smith on SportsCenter Monday morning boasted that he was unaware that Columbus has a National Hockey League team; despite 13 years of existence and, at the very least, having been the trading partner with the New York Rangers for Rick Nash, the same Rangers team that plays in the city where Smith has a daily radio show to, presumably, talk local sports. That buffoonery emerged at the end of Monday’s S.A.S. rant about the NHL, specifically the Chicago Blackhawks’ 21-game point streak to start the season, obliterating the previous League record. Because ESPN can never judge the NHL on its own merits, the gimmick here was the comparison between the Miami Heat’s 14-game NBA winning streak vs. Chicago’s completely incomparable streak in a completely incomparable sport. Hockey … has … ties? Well, of course it does. That’s why the Blackhawks’ record isn’t called a “winning streak” by anyone with a tangential knowledge of the NHL, but rather a point streak. In fact, that’s what the ESPN graphic said to begin the segment. Why would a point streak be counterfeit because of a “tie”? Better question: Why is this national sport commentator unaware that the NHL changed its playoff format two work stoppages ago? First off: That's a lovely tie he's wearing. But there are no ties in the NHL. There are ties, however, in the NFL, just like in soccer. Maybe it’s a fu[oo]tball thing. You don’t have to. There are no ties. Go yell at the NFL. You know, the multi-billion industry that ESPN is desperately attempting to corner the market on for American television? 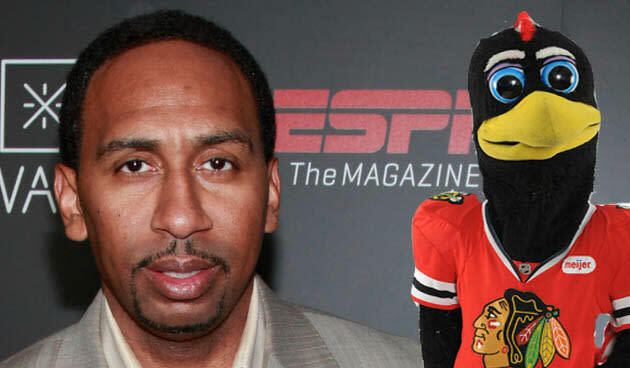 Please, no more of this Stephen A. Smith on the NHL. Give us Wilbon or Kornheiser. As least they knew how to fake it better when writing columns about the Capitals back in their ink-stained days with the Post. Here’s more from Sports Media Watch on SportsCenter hitting rock bottom.